I HAVE A BELLA D ESTE MODEL #0315S00 4-1 CRIB and need Bella D Este 4 in 1 Crib Parts and an instructions manual that includes a parts diagram sheet. I AM LOOKING FOR A PARTS SHEET MANUAL AND A PLACE I CAN PURCHASE/ORDER SOME REPLACEMENT PARTS. Go Here to See What's Available for a Bella D Este 4 Convertible baby crib. If anyone has any suggestions for a resource that carries Bella d'Este replacement crib parts would you please contact me using the space below (and PLEASE include your contact information in case I need to get in touch with you!). Unique Baby Gear Ideas encourages our visitors to share their resources for Bella D Este 4 in 1 Crib Parts, alert us to crib recalls and to consider writing reviews of their cribs to make our little community of expectant parents aware of any problems that are associated with different models and brands. 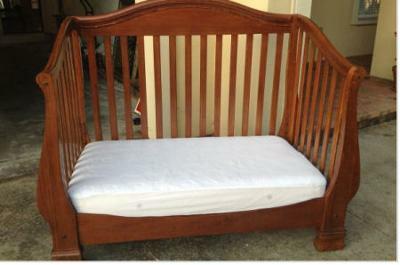 I have a crib, model # DJ209B4, we lost all the screws and hardware during a move. The baby is only 10 months old, and still needs his crib. He has been sleeping in his pack n play while we continue to search for the lost parts. Do you know who I can contact for replacement hardware? I have a few questions. Is your crib the Claremont? Also, what parts are you missing exactly..or do you know?